In reading, eye tracking is the ability to follow the sequence of printed text, and to keep your eyes on what you're currently reading, without jumping around to other parts of the page. Students who struggle with eye tracking, have trouble maintaining focus and moving their eyes to follow the left-to-right sequence of printed text. For these students, reading can be a tedious, frustrating, and exhausting experience. Fortunately, eye tracking skills can be practiced and improved. With Gemiini's Eye Tracking Tool, students can actually train their eyes to track printed text accurately while reading. With Gemiini's Eye Tracking Tool, you select a short passage for your student to read, and set the text to be revealed letter-by-letter, word-by-word, or sentence-by-sentence. Limiting visual distractions helps students focus on the text they are currently reading, and revealing one piece of text at a time, forces their eyes to track the flow of the text. You can think of this tool as training wheels that keep your student's eyes doing what they're supposed to, strengthening eye tracking ability over time. Revealing words letter by letter to help teach letter identification, spelling, and sounding out words. Using the word-by-word or sentence-by-sentence setting with students who read too quickly and have low reading comprehension. Reading fast is a coping strategy students often acquire when articulation is poor. It can also be the result of ignoring spaces and blending words together while decoding. This makes comprehension of the text near impossible. 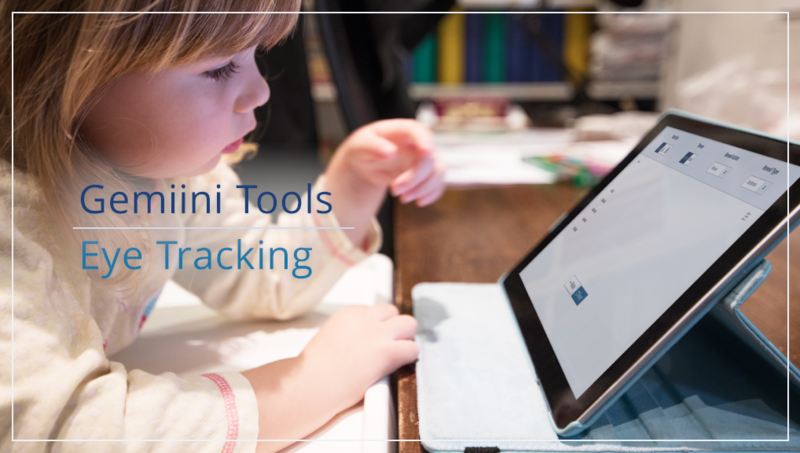 Gemiini's Eye Tracking Tool improves pronunciation and comprehension by forcing students to slow down and focus on one element of the text at a time. Follow these steps to set up an Eye Tracking activity for your student. Log in to Gemiini with your Managing Account. Select the Tools button from the Navigation menu. Select Eye Tracking on the Tools page. Select a book from the Document menu. Set the Reveal Type to choose whether text will reveal letter-by-letter, word-by-word, or sentence-by-sentence. Use the Reveal Action menu to select how the student will reveal the next piece of the text. Students can touch the screen to reveal text on tablets and touchscreen devices, or they can click the mouse, press the spacebar, or press the enter key while using the tool at a computer. Once you've set up the activity, you can Preview or Assign it . When you click "Assign", you'll then choose which student you would like to assign the activity to, and select "Send Assignment". It will appear on that student's assignments page. Select Play to start the activity. Click the mouse, press enter or spacebar, or touch the screen to reveal the passage one letter, word, or sentence at a time. Several of the activity's settings can be changed from within the activity by selecting the Settings menu (upper right hand corner). The Theme from light to dark (for readers who prefer to read against a dark background). When you've reached the end of the text, select Reset to start again from the beginning, or select Finish to quit the activity. This kind of practice is similar to how you might cover up a book with a piece of paper and slide it down the page to reveal one line at a time to keep your student's eyes from wandering to words they don't need to focus on. Gemiini's Eye Tracking Tool allows students to practice reading this way independently. With regular practice, eye tracking will require less dedicated effort, and reading will become easier for your student. 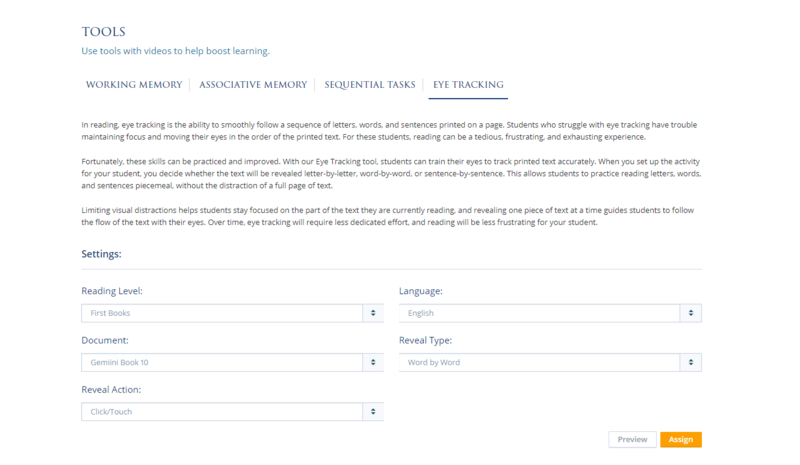 Head on over to the Tools section of our website, and set up an Eye Tracking activity for your students today! If you have any questions about using Gemiini, please schedule a free call with one of our Product Specialists. If you're having technical trouble or need help getting started, check out the articles in our Knowledge Base. Please reach out to us with feedback or concerns at videos@gemiini.org, and keep an eye out for new features!